I’ve been building a pair of modules for the S Scale Workshop, and documenting them for TrainMasters TV. The module standard specifies a height of 50″ from the floor to the top of the rail. Since I didn’t know the final height of things like roadbed, subroadbed, the thickness of glue, and so on, the legs were left a little long until the modules were built. Then a final measurement of the height was taken, to determine how much to cut off each leg. As I work towards this coming weekend’s North Shore train show in Laval, Québec, I realized that I was unhappy with the ballast on the two modules I’m building to use with the S Scale Workshop exhibition layout. Looking at some of the prototype photos I’m using for inspiration, the problem was immediately apparent. There was too much ballast. This was not the effect I wanted. As the lead photo shows, a more subtle ballast profile was called for. 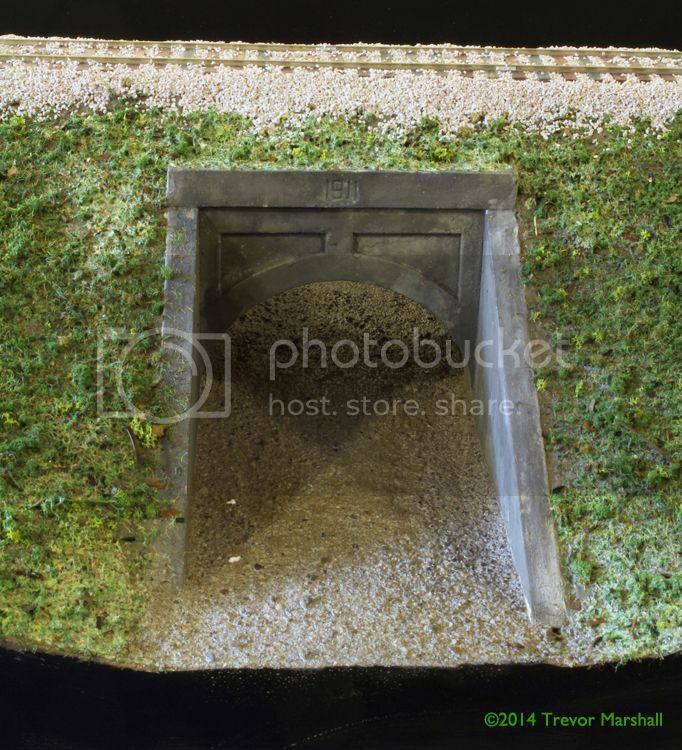 So one of my tasks this past weekend was to layer some more ground cover onto the sloped sides of the roadbed. 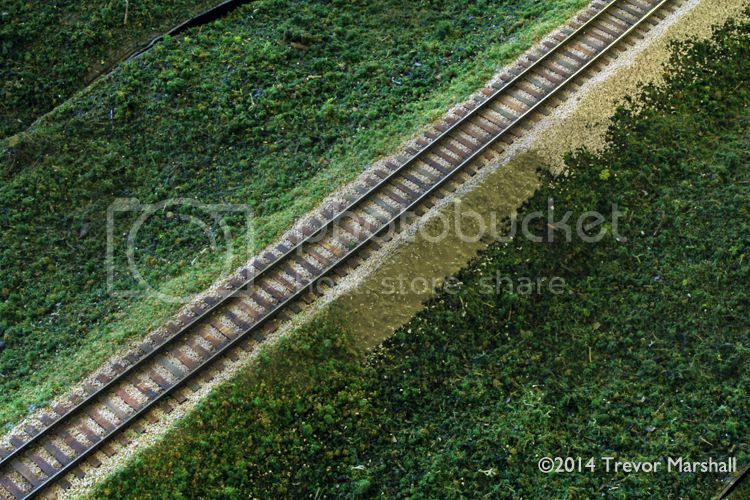 At upper right, the original ballasted roadbed. In the middle, I’ve brushed on some of my basic terrain-coloured paint (a greyish brown called “Monk’s Cloak”, if memory serves). At lower left, some ground cover material scattered over the paint. I’m much happier with the revision, although I’m also glad I did all that ballasting as the ballast provided a good “grip” for scattering material on a slope. Once again, our fellow modellers in the UK show me how it’s done – this time, in the publishing world, as Greystar Publications launches a brand new quarterly publication. As the name implies, this new effort focuses on finescale modelling – in other words, the UK equivalent of the philosophy that drives Proto:48, Proto:87, the RPM movement and other thoughtful modelling endeavours on this side of the pond. 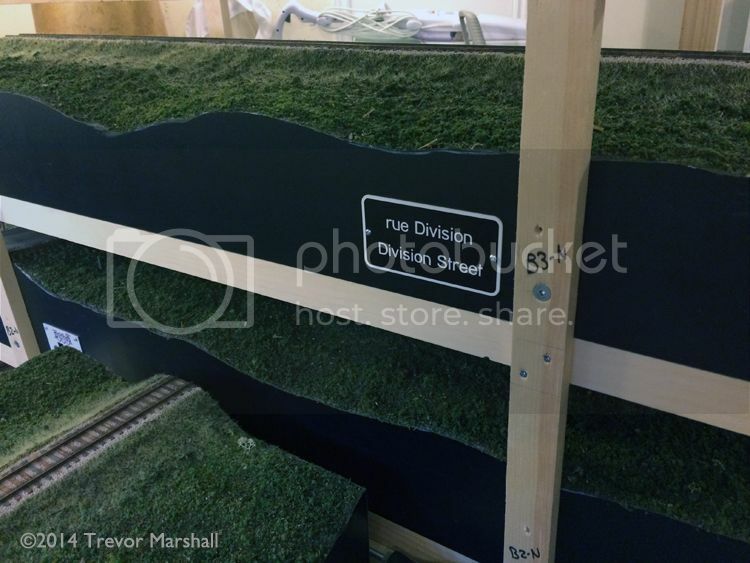 Already, the Finescale Railway Modelling Review is being praised by those who care about these things (such as this post on the Albion Yard blog), with high hopes expressed for publisher/editor Bob Barlow and co-editor Tim Shackleton. And those are just the ones of which I’m aware. I find it interesting that the United Kingdom (2011 population: less than 64 million) can support at least two magazines devoted to finescale modelling, plus numerous other magazines that focus on niche interests (e.g. 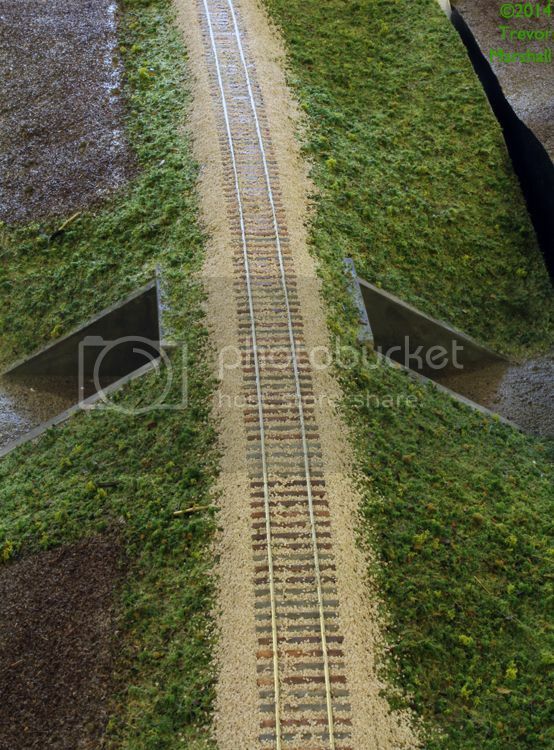 : Miniature Railway magazine, about commercial and garden railways built to ride-on sizes)… while here in North America (2014 US population: more than 318 million; 2014 Canada population: more than 35 million), finescale publications such as Mainline Modeler and Prototype Modeler are a distant memory. We’ve also lost the hard copy editions of the three terrific annuals produced by Westlake Publishing (although I do note that there’s a 2014 Narrow Gauge Annual available as a digital download). And Prototype Railroad Modeling from Speedwitch Media arrived with great promise in 2005 but lasted just two issues (although publisher Ted Culotta recently published a new book after several years, so the publisher is still active at least). What’s still available? Well, the Railway Prototype Cyclopedia is a valuable resource at 28 volumes and growing. It does tend to focus on documenting prototype equipment to aid modellers, rather than features on models and model railways. But despite having a combined population of more than 353 million – more than five times the population of the UK – we seem unable, in North America, to float even a single magazine aimed at the expert modeller. Yes, railways are more relevant to daily life in the UK than here in North America, so it’s safe to assume that a greater percentage of the UK’s general population is an enthusiast at some level or another. But even if the North American hobby, as a percentage of our total population, is just 20% that of the UK, the number of hobbyists would still be the same – and yet periodicals aimed at the top 5% of hobbyists (plus those who aspire to that level of excellence) seem doomed to sink. 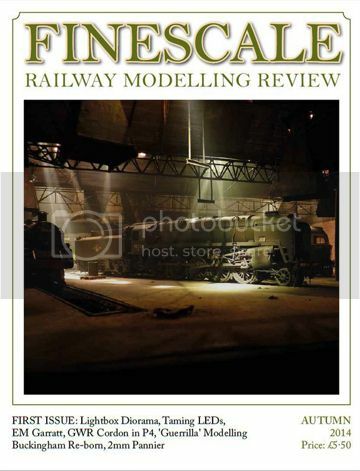 I’ve placed a one-year subscription to Finescale Railway Modelling Review: I look forward to my first issue. 10 days … and counting! I might have mentioned it here once or twice already, but I’m building a pair of modules in S scale and taking them to a railway hobby show in Laval, Québec to participate in the S Scale Workshop exhibition layout. 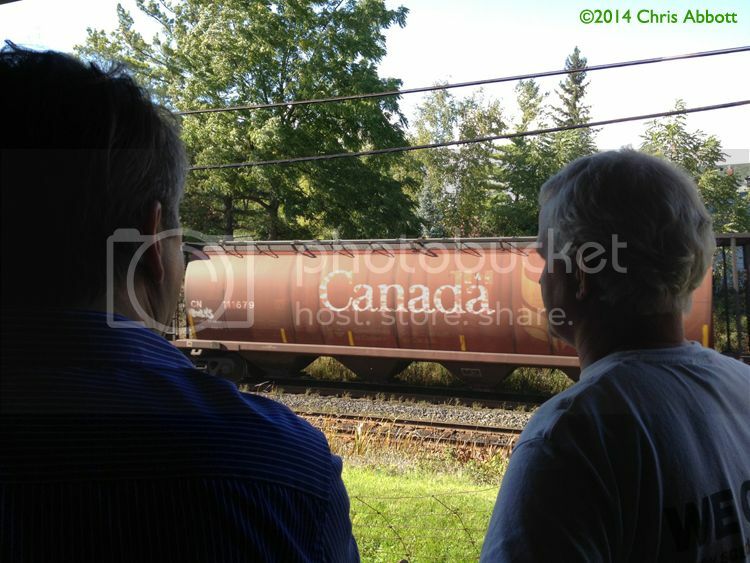 That show – Salon due train rive nord (or: The North Shore Train Show) – happens October 4 and 5. So I’m down to the wire. With the work done earlier this week on the Judge Farm module, I now have basic ground cover and ballast on four of these sections – 16 feet in total. I have six more feet to do, then I can turn my attention to seeing how many details I can add before the show. If you’re in the Montréal, Canada area two weekends from now, why not come out to the show and see how I made out? Before last night’s wiring session, I knocked out a huge pot of chili – excellent, if I may be immodest – and laid in a few bottles of Funnel Blower from Box Steam Brewery in Wiltshire UK. Together, they got us through our six-hour wiring marathon. If you want help with wiring, cook something hearty and buy good beer. 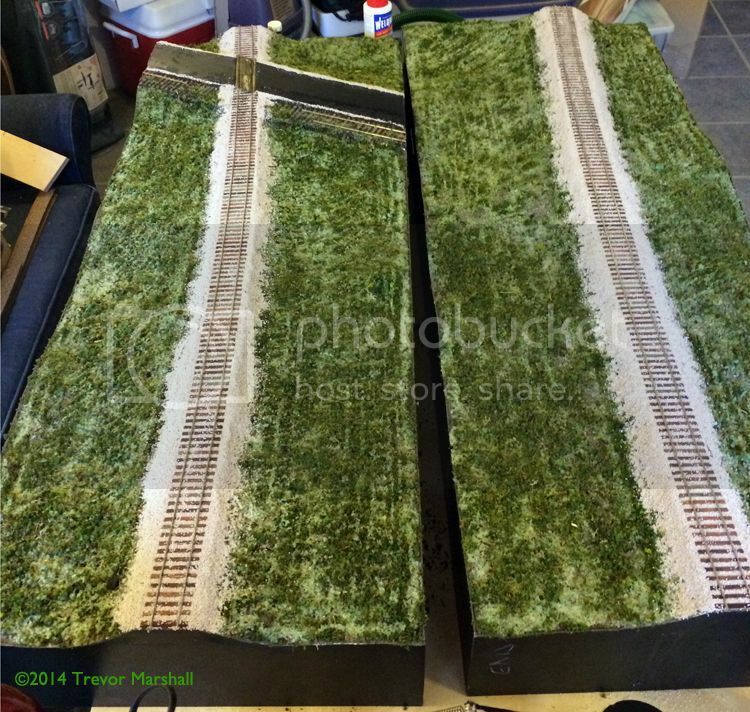 Today I airbrushed the rails on two four-foot sections from the Judge Farm module that I’m building for TrainMasters TV. 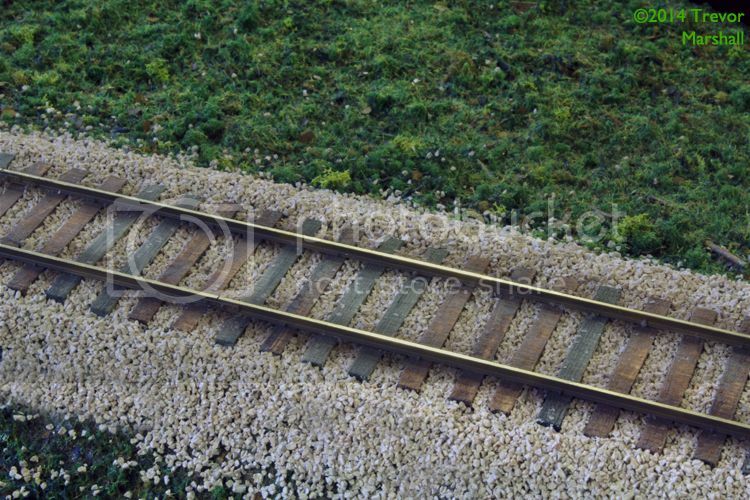 “Rail Brown” is hard to find these days as traditional railway hobby paint lines dry up. Instead of fretting about this, I grabbed a bottle of “Leather Brown” from Acrylicos Vallejo – item 70871 in the “Model Color” line – and used it instead. These paints spray well and dry dead flat – and I think it worked just fine. I’ll have to grab another bottle, though – the one I have may run out before I finish all the track. Sharp-eyed readers will note the joint between two rail sections in the foreground rail, just to the left of centre. 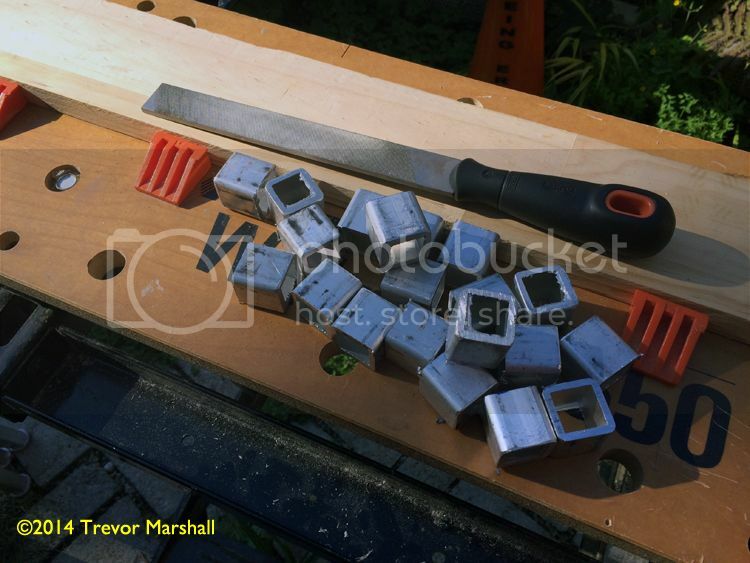 I notched the top of the rail head with a fine saw before applying the joint bars to either side of the web. The paint gets into the notch and does not get removed when cleaning the top of the rails after airbrushing. 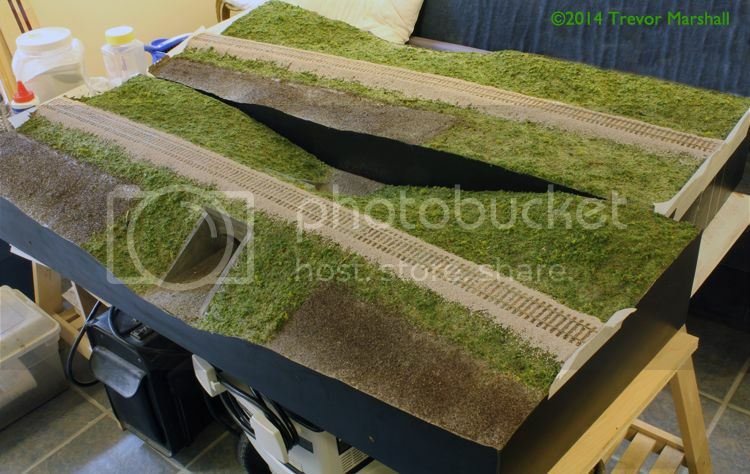 These two sections aren’t yet finished – there’s a lot more scenery work to do. But they’re now close enough to finished that I can show them as part of the S Scale Workshop modular layout at The North Shore Train Show in Laval, Québec in a week and a half. That’s the good news. The bad news is I still have two more four-foot rectangle sections – plus four small trapezoids – to wire. And then I have to sling scenery, ballast and more “Leather Brown” paint. 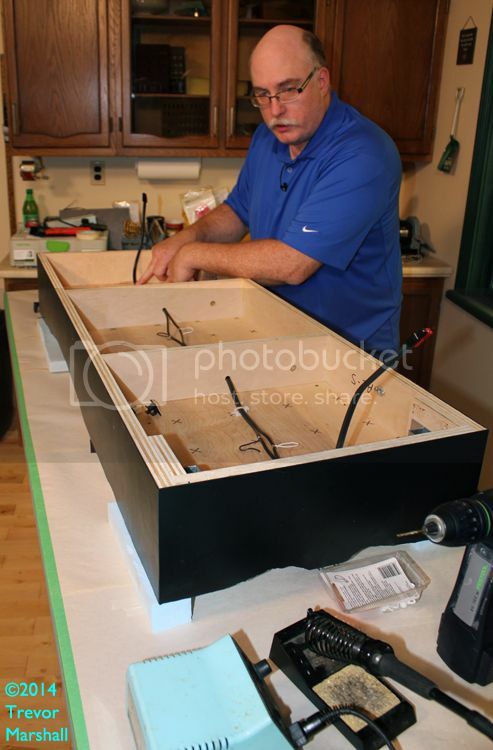 I’ll get there – and my friend Chris Abbott is coming over tonight so we can work on more wiring together. Truth be told, It’s unlikely I will have many opportunities to use the modules I’m building for TrainMasters TV. That’s just the way my life works. However, I don’t think they’ll spend all of their time slumbering under my home layout. 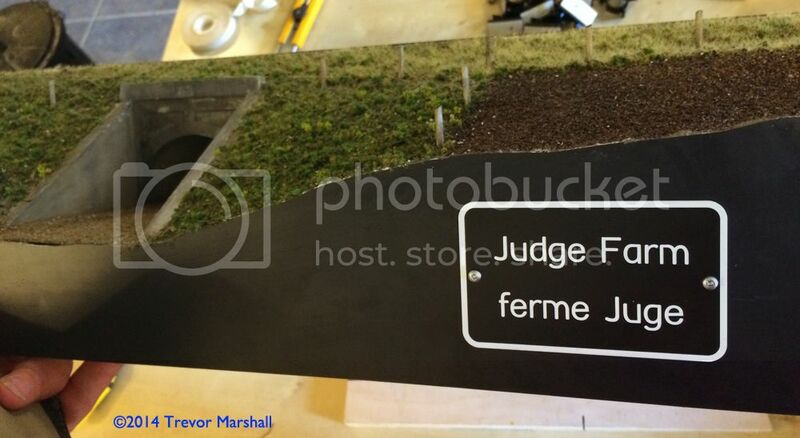 For one thing, the overpass on the Judge Farm module set has some great potential as a diorama for eye-level – or even above eye-level – photography. I tried it out this morning after cleaning up the ballast on the ties and airbrushing the rails. The photos in this post were taken in a room in my basement, with just the bare walls as backdrop. 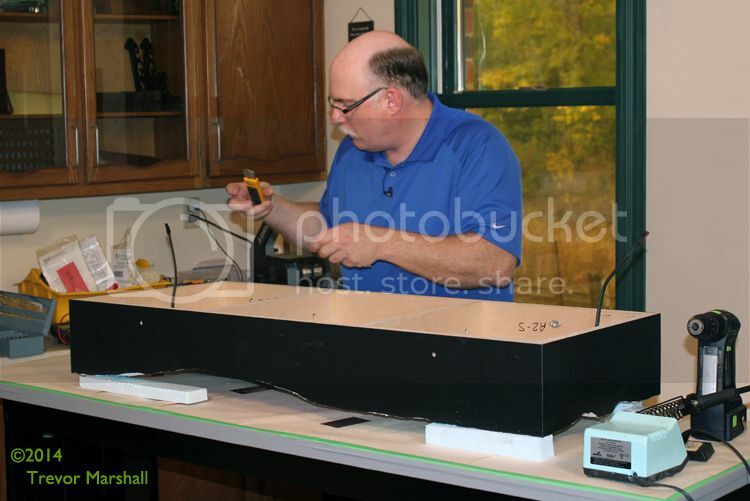 Over the weekend, Chris Abbott joined me in the TrainMasters TV studio to demonstrate some best practices and neat ideas for wiring the two modules I’m building and documenting for the show. We covered a lot of ground – from installing drop feeders and track power mains… to using Anderson Power Poles for connections… to building our own cables for the throttle network and mounting the throttle panels… to adding strain relief to all wires and cables. I’m really pleased with how the day went – and, it gets me closer to being ready for the exhibition at which I’ll join other members of the S Scale Workshop to entertain the public for two days. Thanks again, Chris! I don’t consider this anywhere near finished, but if I get all sections done to this point they will at least be respectable enough to show. I may have to cover some scenery-building techniques after the exhibition – fabricating dioramas as needed to demonstrate various approaches. We’ll see how things go. Chris is coming over this week to help me with the wiring on the rest of the module sections. With luck and focus, we’ll get it done in an evening. 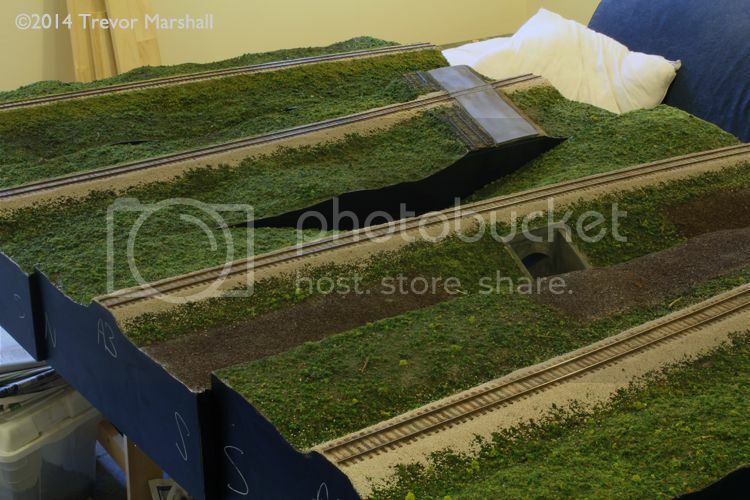 That will give me some breathing space to demonstrate some basic ground cover during my next visit to the TrainMasters TV studio. The first episode of “The Roadshow” is now live at TrainMasters TV. Yes, that’s me in the very summery, very flowery shirt. This episode kicks off an on-going series for TrainMasters TV, in which I describe building two multi-section modules in S scale – my contribution to the Free-mo style layout exhibited by the S Scale Workshop. In Episode 1 of The Roadshow, I’ll take you on a tour of the places I’m using as inspiration for the modules. That inspiration involves one very colourful shirt… a trip to the country with a high-energy team-mate… a big pair of rubber boots… and a flock of stubborn ruminants. In the series, I’ll share some tricks I’ve learned about building modules – things that work for me, anyway. I’ve also been experimenting with ideas I’ve never tried before. 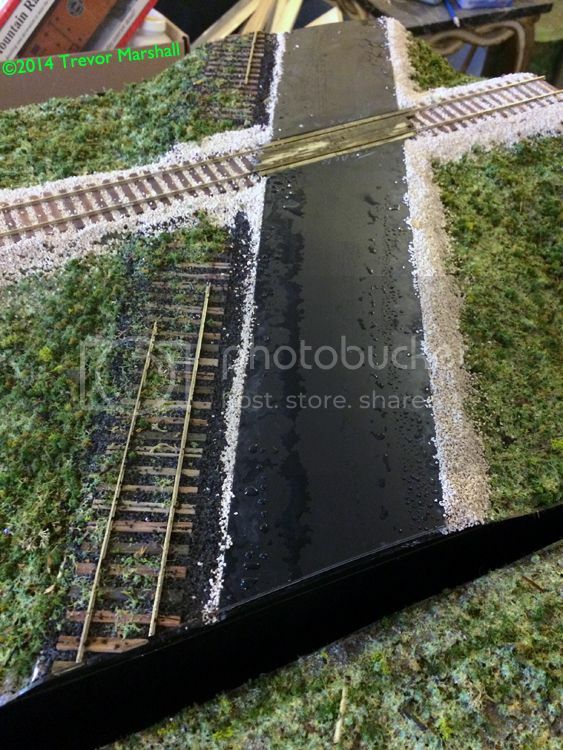 Already, I have a couple of ideas from this experience that I plan to incorporate into my Port Rowan layout. And of course, you’ll get to see some of the techniques I employ in action, as opposed to in a series of still photos (which is what you get here). There’s a fair bit about these modules on this blog already – here’s the category link. But I hope you’ll join me on TrainMasters TV to follow along as I build my modules. 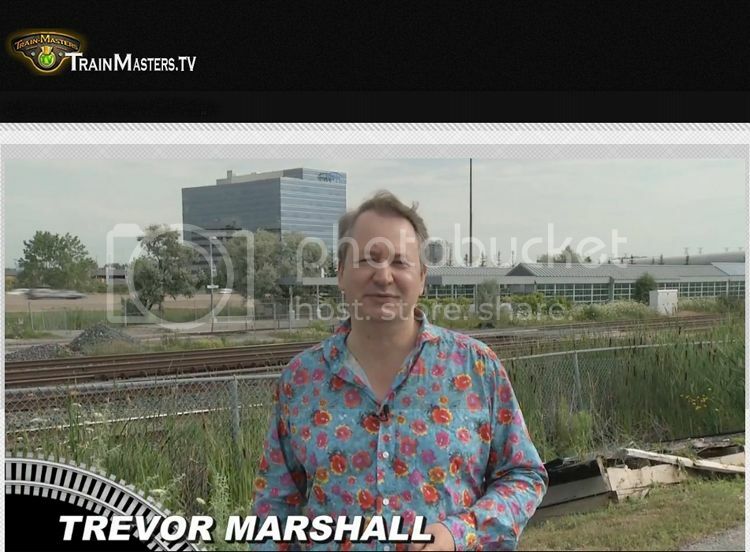 Barry Silverthorn at TrainMasters TV is a professional producer and editor with a fine eye for camerawork. This is not your typical YouTube fare. In a word, it’s slick. I’m tickled that Barry has welcomed me on board to do this series. 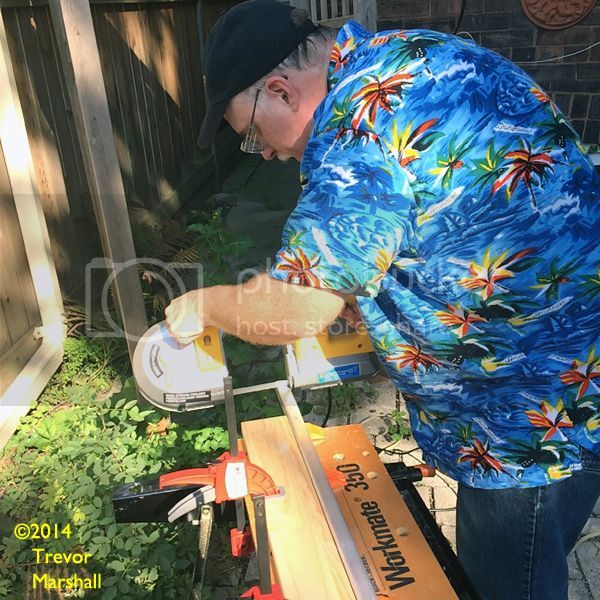 His talent and commitment to creating a great show – hosted by hobbyists and focussed on this great hobby of ours – is forcing me to up my game to match. That said, one gets what one pays for and there is a modest monthly fee for your subscription. But it’s equivalent to buying a package of replacement blades for the hobby knife – and less if you subscribe for longer periods. I consider that a small price to pay to add such a tool to my toolbox. TrainMasters TV is highly entertaining to watch and a great way to get ideas for one’s own hobby endeavours. I look forward to each episode, and I hope you’ll become as big a fan as I am. 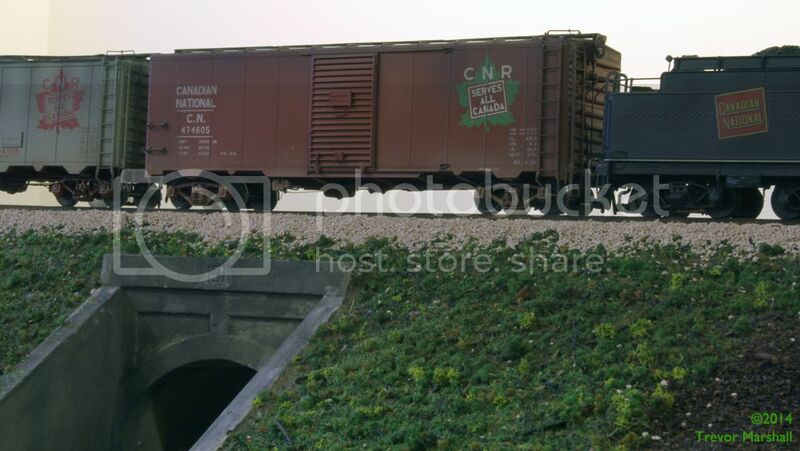 This boxcar started life as a ready-to-run plastic model from S Helper Service. 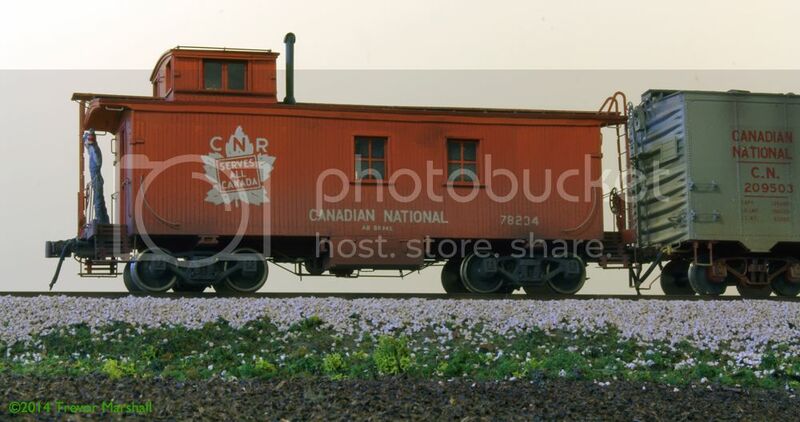 It was factory-lettered for an American railroad but at some point, I realized it would make a decent stand-in model for a class of CNR single-sheathed boxcars in the 461000-463999 series. So I reworked this model (and two others), adding a fish-belly under frame, re-detailing the roof with extra ribs, and substituting brass stirrup steps. I wrote about these changes in more detail in a previous posting – have a look here for more information. This distinctive “wagon-top” covered hopper is a brass import from River Raisin Models, which brought in 158 examples in 1993. I found my model online. It was factory painted but the lettering had not yet been applied. It was, however, in the box. I decided to experiment with heavy weathering techniques to represent a car that had spent many years in cement service. The lettering has been almost obliterated under spills and streaks, although the car number has been periodically cleaned to remain legible. I’m pleased with the effect. This car rarely appears in operating sessions as it’s just an oddball, but on occasion I invoke Rule 1 (“It’s my railway”) to add some variety to a train. 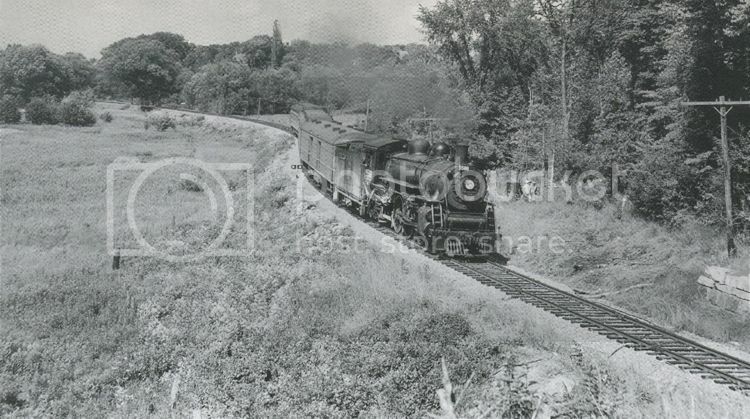 Here’s another lovely import from River Raisin Models – a 40-foot boxcar with horizontal ribs. River Raisin brought in 68 of these (along with 128 50-foot versions) in 1991. I bought my example from Don Thompson (founder of S Helper Service) after posting a note to various newsgroups looking for one. As with all my models, regardless of origin, it has received flexible train line air hoses from BTS. I have written a lot about this car on this blog. 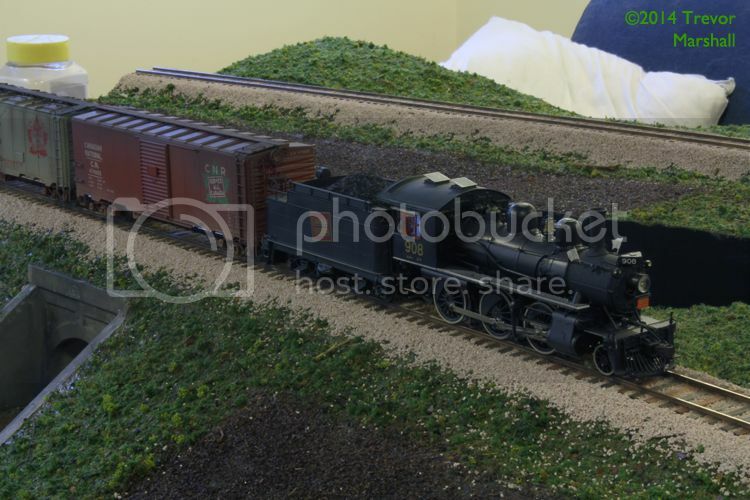 It was one of my first projects for the Port Rowan layout – an extensive re-detailing effort to create an essential piece of equipment for my rendition of the Mogul-era mixed train. The car started as an undecorated RPO from American Models. I added details from several sources as well as a few that I built from scratch. I also added numerous grab irons, brake rigging, real glass in the windows, and so on. Like all of my six-axle passenger cars, this one benefits from Tim Trucks. It remains a favourite project of mine. 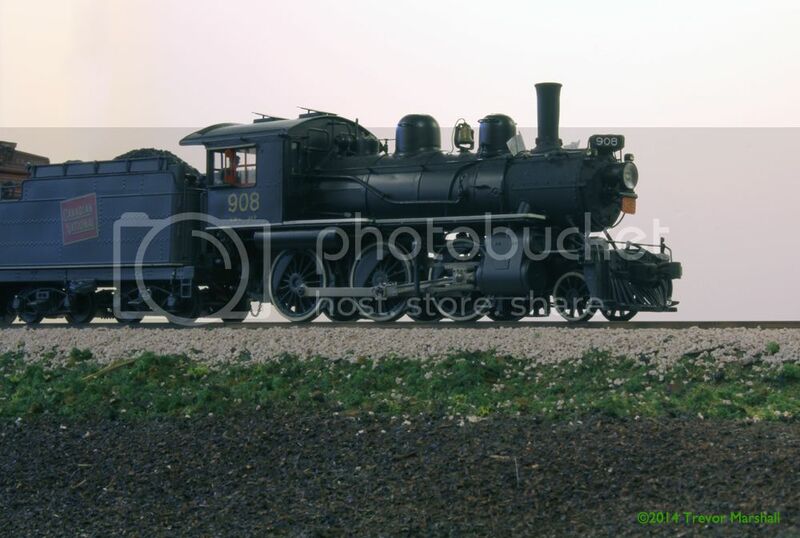 Eventually, I hope to document all of my S scale equipment in this fashion. We’ll see how that goes. Meantime, see the Portraits category to find all posts in this series. If you’ve read this far, thanks for sticking with it. I hope you enjoyed these equipment portraits and notes. 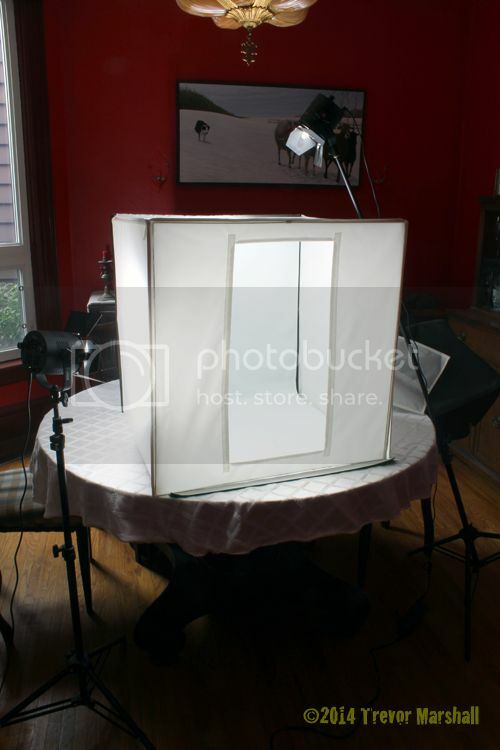 In response to my recent post on equipment portraits, reader Scott Haycock asked for more details on the light box I mentioned. I use a Digital Photo Box from Cameron – a 28″ model, if I recall. I picked it up a few years ago from a local photography store but they don’t seem to be available these days. I’m sure there’s something similar – I’d check with a shop that caters to pro shooters. 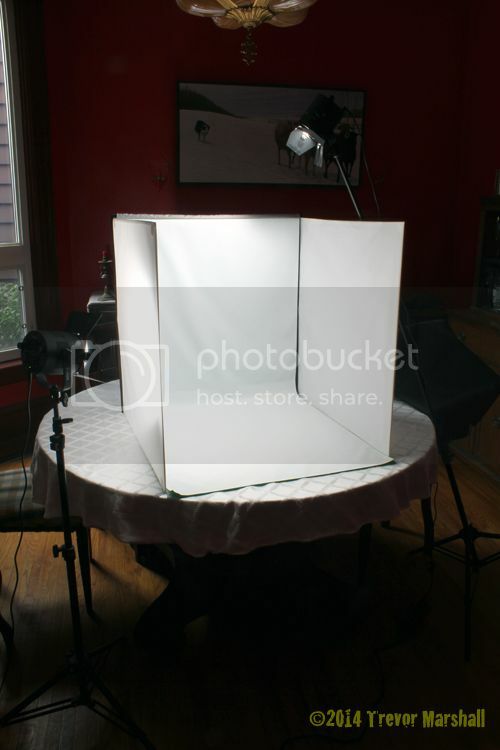 The Photo Box is made of various soft materials over a stiff frame. It comes flat, in its own travel envelope with a handle, and uses Velcro(r) tabs for quick set-up and tear-down. It has an adjustable lens portal so one can completely control the lighting – but I’ve never had to use it. The box also built-in backdrops in white, neutral grey, plus chroma key blue and green (for easier “knock outs” or “crops” in Photoshop). I used the white backdrop for my portraits. Scott also asked about the lighting I use. Earlier this year, I acquired three Fiilex P360 LED lights. These lights have many neat features but what I really like about them is that they remain cool to the touch. They can be left on for a long time – hours even – with no worries about melting plastic rolling stock or scorching valances (or digital light boxes). LED photo lights are still relatively new so they’re also relatively expensive compared to traditional halogen lights. But I’ve done a fair bit of photography – of my own layout, and others – and while I loved my Tota-Lights in their day, one 500-watt fixture can do incredible amounts of damage in a very short time. The cost would be too high were it my own models melted – but immeasurable if I turned somebody else’s prized work into slag. Great question, Scott – thanks for asking!